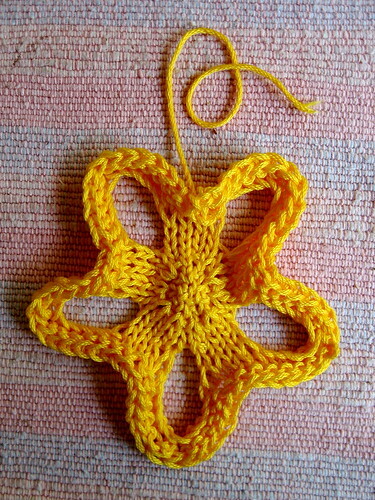 Revknits' Blog | Faith and life seen through the stitches we make. In some regions of the country, Labor Day signals the change of seasons – some folks will not wear white after Labor Day, in other areas, it signals the beginning of school. None of those things applies to the San Francisco Bay area – schools have been in session for a couple of weeks, and white can be worn year round, although in the rainy season, that’s probably not such a good idea. 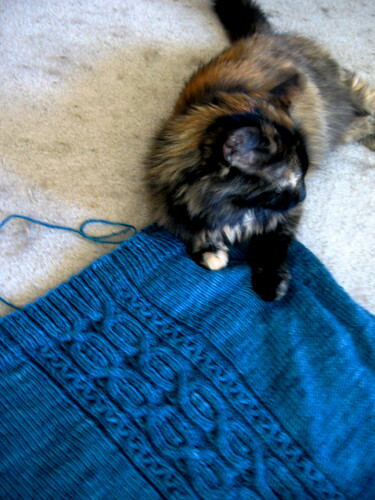 At Casa Del Revknits, we like to think of Labor Day as the changing of the knitting season. 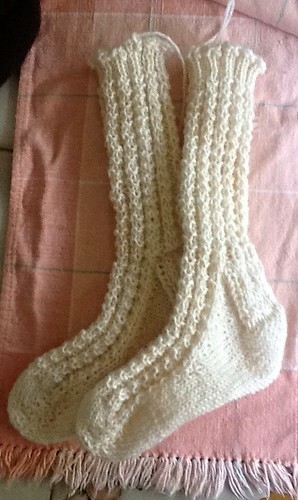 Over the summer, it’s been lace and socks and socks and lace, and maybe a cowl because that’s not too hot on the lap. 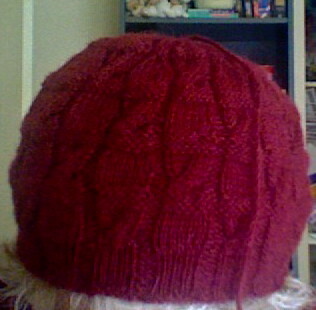 But with the turning of calendar, I was yearning to knit something more substantial, and now. 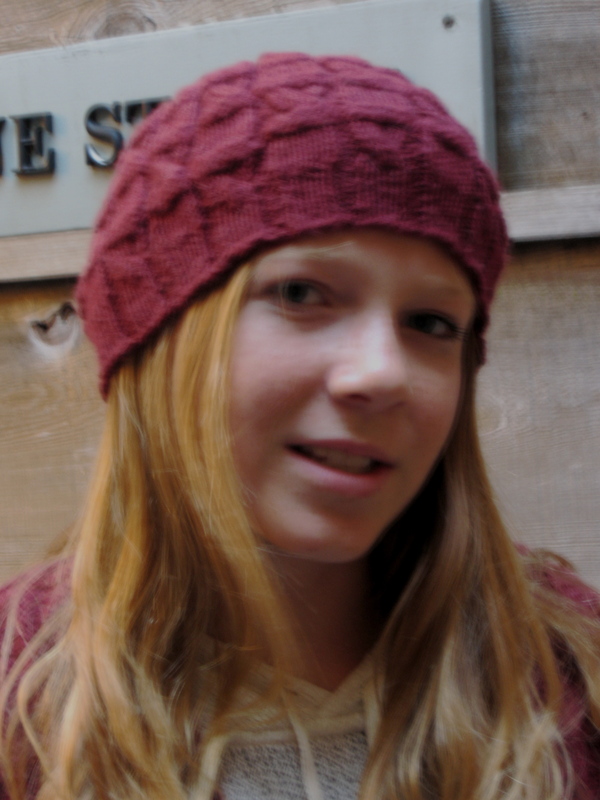 Now is the time for hats, and of course, sweaters! I thought by now I would be knitting a sweater for Amy Herzog’s new software system called CustomFit – which is going to blow the minds of sweater knitters everywhere. I am still a beta tester, but Amy, for excellent reasons, including the loss of her father unexpectedly, had to delay the roll-out, so I’m hoping to begin the sweater process in the next week or so. But if you want to check out what she’s up to – go to CustomFit now, and sign up for the newsletter, or check out the amazing sweaters on Ravelry that earlier beta testers have knit. 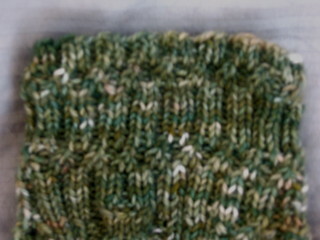 No, that sweater was going to have to wait, so instead, I picked up a sweater I had started in the spring – my Dark and Stormy (my Ravelry project page). Thea Colman created this lovely top down cable sweater, and it has many features that I love, including a deep shawl collar, cardigan, cables in the right places and not too many of them. My big hesitation? It’s that it is a top-down raglan sweater, which can be known to not work so well on women with bustlines. I got to the point of separating the sleeves and had knit down to the waistline when I got indecision about whether to continue – plus the weather turned warm. Even though I had added short rows for the bustline a la Ysolda Teague, and put in more waist-shaping, and tried it on and found that it fit pretty well, I couldn’t seem to give up the idea that this would be wrong. In this case, imagining perfect sweater becomes the enemy of the good. Finally, since it was after Labor Day, I decided to pick it back up and keep going. 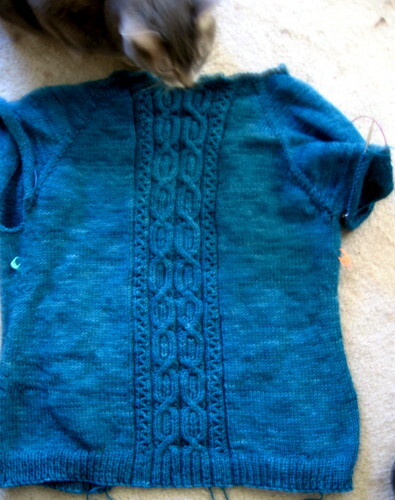 I have now finished the body of the sweater, with kitties doing feline inspection, and then I also looked up other folks’ versions on Ravelry, and decided to cut down on the underarm fabric when I knit the sleeves to reduce the potential for bagginess there. I think this is going to be an excellent decision, and i”m now in cruise mode on the sleeves (one at a time – it’s faster to me, especially with alternating the rounds in two balls with the hand-dyed lovely Miss Babs Yowza! in the rainforest colorway. 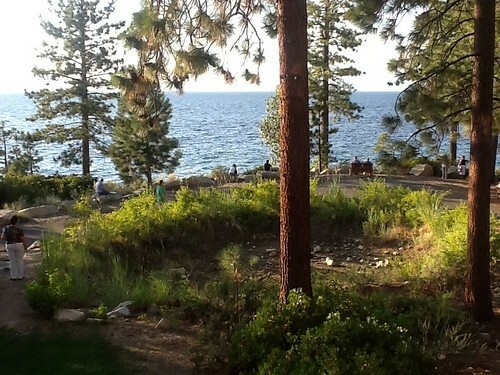 Of course, it was a high 80s day when I did pick it back up – but it was after Labor Day. That made all the difference. 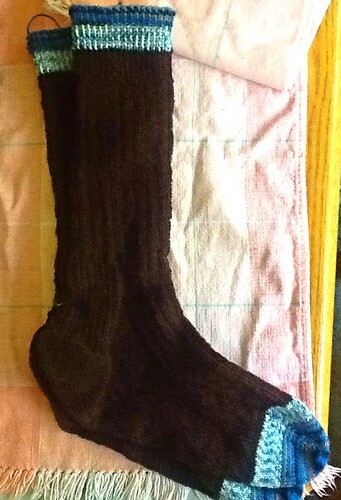 Some socks are proceeding nicely. The Christmas socks are done, done, done (ok, weaving of ends not done, you know what I mean), and I’m very happy with how they came out! Leave it to fine folks Regia to have such a great colorway (Saturn Galaxy, now sadly discontinued) that it pops when used as an accent. I love that when worn, these will be very conservative socks, only the wearer will know about the fun they contain! The Pret-Pret-Pretties socks are on hold as the designer has had other priorities, and with the 80 degree weather here, I can certainly wait a while to finish those. 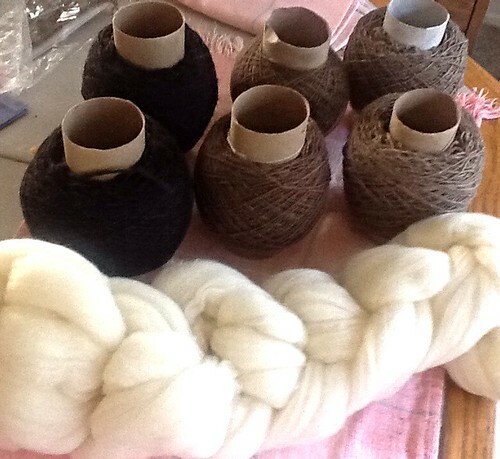 Spinning is going great guns as well — I’m spinning up four natural colors of Targhee – will have about 10-12 oz, probably a DK-ish yarn, and I’m contemplating an actual sweater!!! See the pretty colors? There will be more of the cream color (thanks, Suzaane!). And I’m also about to spin into a new interim position with the gathered community of First United Methodist Church of Vallejo, CA. They are a downtown congregation (yay – back to urban ministry! ), and figuring out life and love in the 21st century. I know that I don’t know what I don’t know, so it will be a learning curve, but one that I hope will be good for all of us. I start this coming Sunday, September 1st! 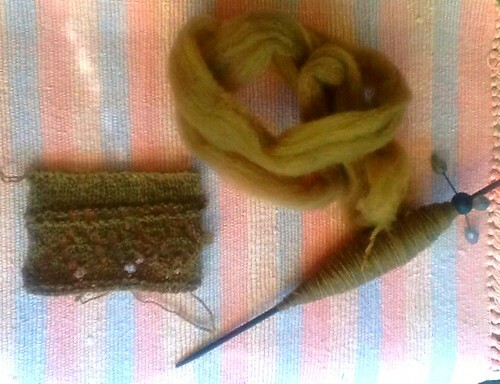 I’ve finally gotten back to the lovely Targhee fiber from Benny’s Fiber – and started to spin it. I’ve decided to use my Trindle (go here for details), which has not gotten a lot of use other than showing off since I bought it. It’s only .5 oz, and with the weight on the outer edges, it can hold a lot more fiber than its own weight. I did a small test swatch, and really like how a 2-ply shows off the lace! I have a total of 6 six colors, and I’m thinking I’ll use 4 of them for this project — which will be some kind of gradient shawl — cream, light tan, golden carmel (the color shown), and deep chocolate. The two greys are lovely, but not for this project. 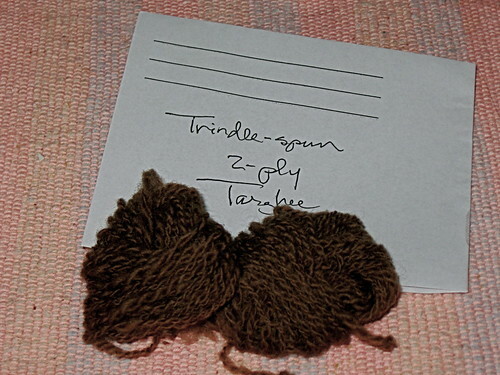 So far, I’ve been able to get double the weight of fiber onto the Trindle – and it’s lovely to spin! There’s something about August. For most ordinary individuals, August means vacations and lightness and fun, and all kinds of lazy fun. For me, if it’s August, I must be down for the count. Two years ago, I came down with chicken pox on the eve of attending what became the very last and final Sock Summit (sob!). I did get some extremely lovely yarn from a blog reader who lives near the Wollmeise store in Germany – it was such a generous gift! Last year, I ended up with a sinus infection that repeated itself three more times in the coming year — and I attended a conference before I knew it, feeling like an old lady because I wanted to hit my room at 8 pm, just like a real 80 year old. I fell, and I fell stupidly, and had no one to blame but myself. I was on a stool at the church I’ve been hanging with, volunteering to help with the Music Campt), and I turned and moved forgetting I was on the stool, and took a tumble. 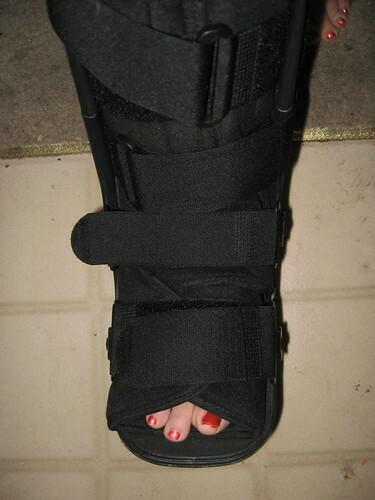 I thought I had just badly sprained my ankle but a friend took me to urgent care, and it turns out that I had nicked the fibula, so it’s a fracture, but apparently the kind of fracture that is treated more like a sprain. Oh, the things I thought I would do — well, they aren’t getting done. At least not now, on the original timeframe. I’m most of the way through the second one, although apparently while knitting in bed and watching my iPad, I cannot knit 3×1 ribbing reliably in a dark color. 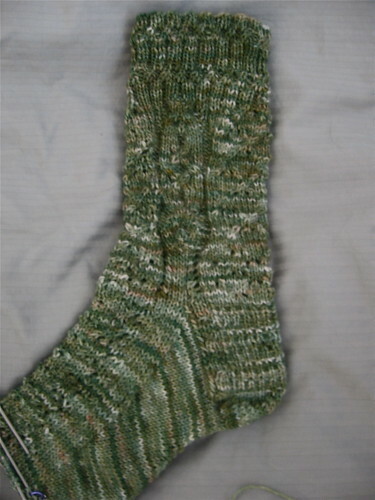 I had to reknit a good part of the 2nd leg. Second, I have a pair of challenging socks. These are Pret-Pret-Pretties (Ravelry link) by Heather Ordover, found in the What (Else) Would Madame DeFarge Knit. 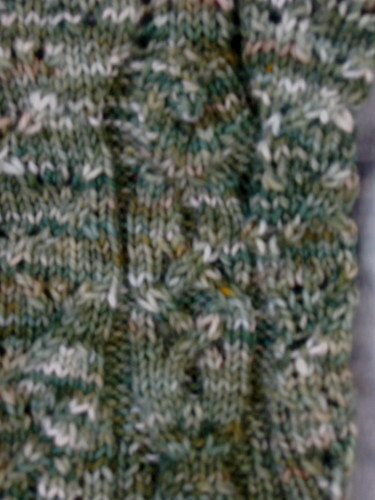 I had problems, first because the e-edition of the book didn’t have the correct cable stitch pattern for the cuffs, which I found out about through Ravelry (and was correct in the print edition). 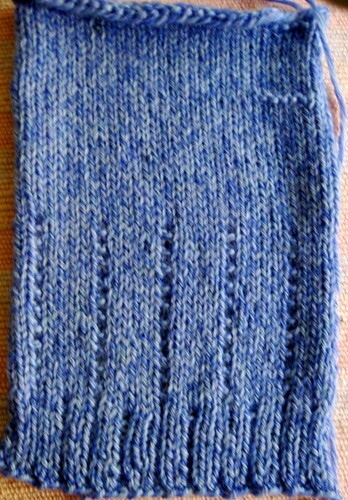 It became painfully obvious after knitting the heel that something was seriously amiss in the pattern – as in, oops – that stitch pattern will not fit into that number of stitches! So I contacted Heather who has become a friend, and together we are figuring out what happened – as the editor of the book, Heather was better about getting other people’s patterns fully tech-edited than she was about her own. She did design it well, and correctly, so she’s basically recovering her initial genius! 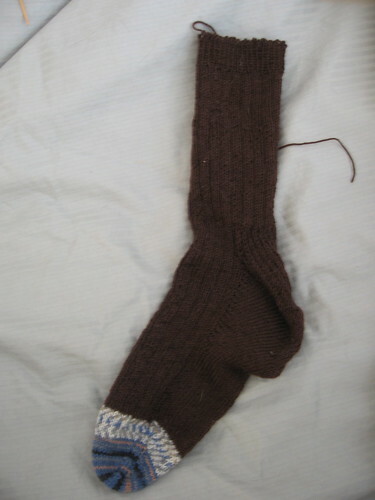 It’s a lovely sock, and I’ve learned three new things in knitting them, so it’ll all work out. The yarn is Cascade 220 quattro (each of the four strands are a different color, which gives the heathered color), and I’m going to knit a very basic cardigan sweater. Sounds boring, right? Here’s the exciting part – I am a beta test knitter for a new software service by Amy Herzog — Custom Fit – which will take your measurements, your desired sweater shape and treatments, and create custom knitting directions via her software. It’s brilliant and so needed! But I am in one of the later testing groups, and while for a brief period it looked like I would be knitting while recuperating, but my contribution to the test knitting is now delayed to early September. There’s a bit more to report on the job front, and fiber-wise, but I’ll post that stuff tomorrow! As a budding designer, I find that often my patterns come from playing with stitches on the needles and “unventing” a stitch pattern. I’m working on a super-secret project, but in doing so, I came across a cool pattern that would really work for the mindless knitting we all need in our lives. It’s a simple, one row stitch pattern with lace, ribbing, and a stable edge, so it’s perfect for a scarf or shawl project. Which means if you cast on a multiple of 5 plus 6 stitches, you can just keep knitting this pattern ’til you run out of yarn, and you’ll have a scarf or shawl. Enjoy, and please let me know if you try this out! The first of a few patterns I’ve designed is out today! Let me introduce the Stagger Ribbed Cowl. This was a sneak design. I started with the task of knitting a sample for my LYS store for an upcoming class – the Stagger Cowl in the Knitscene Accessories issue. 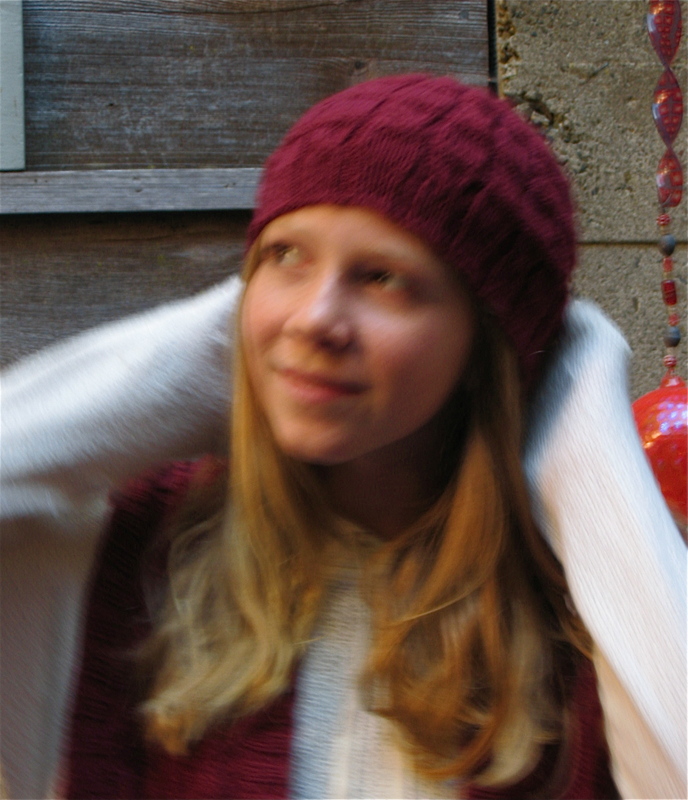 As I knit the cowl, I realized that the simple stitch pattern would lend itself to a lovely hat, and since stitch patterns are not part of copyright, I created a pattern for a hat to be used either in combination with the cowl, or stand-alone. 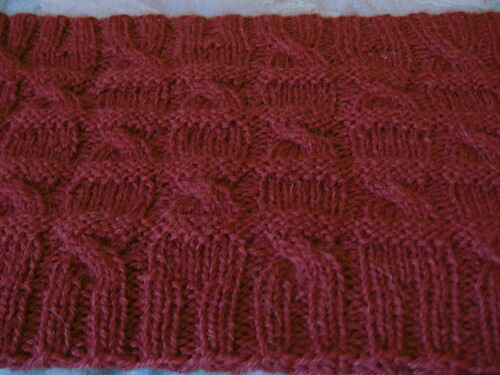 This cowl is a great introduction to cables, as the cable stitches are in only 2 of the 20 rounds of the stitch pattern. See how pretty the stitches are? Because this is my first paid pattern in a while, ror the rest of the month, the pattern is available at 50% percent off – a bargain at $2.50! Yes, I worked a 70-hour week, but that was right outside the doors! In commemoration of the waters, here’s a sea-themed free pattern that will be used in an upcoming yarn-bombing of a not-to-be-named local yarn store.